HPAT – Ireland scores can only be used for admission to a course commencing in the same year. Please note if applying to undergraduate medicine, you do not need to use Leaving Certificate results from the same year you're sitting the HPAT-Ireland test. Results from a previous sitting of the Leaving certificate can be used when applying through the CAO. There is no restriction on the number of times you may take HPAT-Ireland, provided you are a bona fide candidate each time. Please be warned that when all candidates register to sit HPAT-Ireland they will be required to check a box declaring that they are either doing 6th Year in 2019 or have already completed it, or its equivalent, prior to 2019. They will also have to declare that they are a bona fide student. A 5th Year student is NOT a bona fide student. If ACER is made aware of a student who provides a false declaration, their results will not be released. In 2019, ACER will check for “re-sit” students. If a student is found to have, in effect, signed a false declaration in 2018 his/her HPAT-Ireland 2019 results will NOT be released. Hence the opportunity to enter their selected course will be denied. 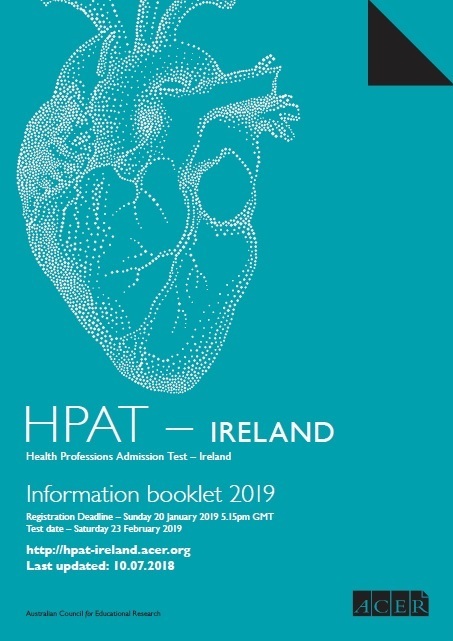 If a 6th Year student sits HPAT-Ireland in 2019 and is unsuccessful in gaining admission to their selected course he/she may then sit HPAT-Ireland as often as he/she wishes in later years.